At its surface, it is simple enough: religion plays a huge role in African-American communities, but for a long time, this religious, primarily Christian, inclination was not surfaced in the same way. Now, due to changing trends and social attitudes both within the country and the hip-hop community, we are seeing a rise in the prevalence of religious imagery, lyrics, and iconography in rap. Like many trends in modern hip-hop, it started with Kanye West. Today, hip-hop is a much different genre than it was ten or fifteen years ago. Far from its more rugged origins, hip-hop has gone mainstream. This is due in large part to the critical and commercial successes of Kanye’s Graduation and later 808’s and Heartbreak. Throughout its history, religion, especially Judeo-Christian religions, have been a large part of rap, but in the last few years, we have experienced a shift in the way in which religion is used in rap music. Religion is becoming a topic of songs and albums, crucial parts of an artist’s message outside of the Christian music genre. Compare that with contemporary religious rap, which seems more like a celebration of one’s individual experiences with faith. Talking about happiness, joy, faith, love, and other couple emotions in mainstream rap is a newer phenomenon. 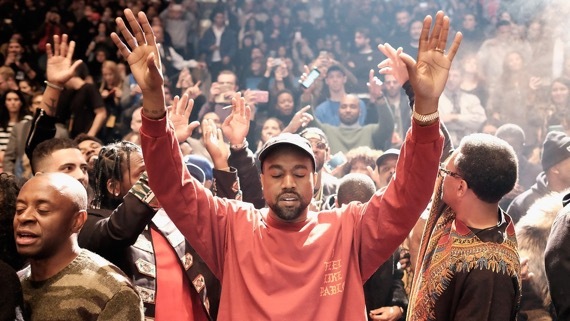 After Kanye changed the game, mainstream rap softened its rough edges and broadened its subject matter. It went from gangsta rap being the dominant force in rap to a much more emotionally focused genre of music in the span of a few short years. Look at “Blessings,” Chance the Rapper’s love song to God and his daughter from last year’s Coloring Book. It is a song about Chance’s relationship with God, and this kind of tenderness and devotion is emblematic of the new age of rap we live in. The idea of giving oneself up to God, giving your life over to them, is central to the idea of many religions. But it is also the shift of focus away from the self that is remarkable. Where once prayers were said for safety before giving themselves up for dead, now rappers spit prayers while giving themselves up to God. This humility is part of the new rap that Kanye helped start, as odd as it sounds. Challenging the status quo, songs about the self and the artist’s feelings and experiences started to gain wide consumer appeal. Songs about fragility, fear, doubt and imperfection that tied directly into an artist’s relationship with God. As our society evolves, so does our music, and we have come a long way in the last ten years in terms of what we consider normal. The hyper-masculine, violent, and sexualized world of gangsta rap is one that dominated for three decades and during that time, some amazing music was created.In this last decade, however, our society has experienced a cultural upheaval. We are moving away from that image and towards a broader one that encompasses more people and their experiences. And a large part of the American experience, especially the black American experience, is tied to religion. Artists are taking steps to embrace this everyday, sharing the personal conversation they have with their God with people across the world. To open themselves up in new and vulnerable ways. As we move forward, this will only continue. Chance just won a Grammy for Coloring Book, and its heavily religious themes are even more emphasized than most in mainstream rap. As this expression becomes both accepted and lauded, more artists will be willing to follow down the same path.